Defrost frozen Wild Blueberries in the microwave. Save 3 tablespoons of juice for the Panna Cotta. Put cream in a medium saucepan and sprinkle gelatin over it. Let sit for 5 minutes. Turn heat to low and cook stirring until gelatin dissolves completely but cream doesn’t boil. Add 1/2 cup sugar and stir until dissolved about 5 minutes. Remove from heat, stir in vanilla and reserved Wild Blueberry juice. Pour into molds and refrigerate until set, about 6 hours. For the Sauce: Put Wild Blueberries, 2 tablespoons brandy, 2 tablespoons sugar, and 1 tablespoon lemon juice in a saucepan. Bring to a boil and cook about 5 minutes until sugar is dissolved. Blend slightly with an immersion blender, keeping some berries whole. Cool. To Serve: Detach the Panna Cotta with a pointed knife. Place molds in warm water briefly to loosen Panna Cotta and unmold onto dessert plates. 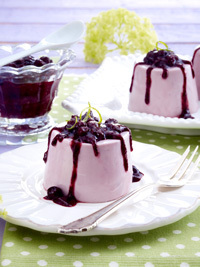 Spread the Wild Blueberry sauce over the Panna Cotta.